Supporters and opponents of congestion pricing will face off, followed by a question-and-answer session with the public. Tonight's congestion pricing forum is two miles from the nearest subway stop. You can also get there on the B41, if you don't mind the traffic on Flatbush. The event is at American Legion Post 1060, located at 5601 Avenue N in southeast Brooklyn, two miles from the closest subway stop and far away from Brooklyn’s most traffic-choked streets. The program pits two congestion pricing supporters against two opponents. On the pro side are Move NY Campaign Director Alex Matthiessen and Community Service Society Policy Analyst Irene Lew, who will face Queens Council Member I. Daneek Miller and longtime anti-congestion pricing activist Corey Bearak. Each panelist will give a short presentation before taking questions from the audience. While the Brooklyn Democratic Party’s influence has waned in recent years, particularly in the transit-oriented neighborhoods of western and northern Brooklyn, the influence of party regulars should not be discounted, especially in the borough’s more car-centric districts. While the 62 percent of Brooklyn workers who commute by transit far outnumber the 4 percent who car commute to the CBD, politicians from southeast Brooklyn have traditionally joined with Eastern Queens and Staten Island in an anti-congestion pricing bloc. Given that context, it’s all the more important that county leaders hear from their constituents, the vast majority of whom would stand to benefit from a pricing system that reduces traffic and funds transit. Tonight’s event will start at 8 p.m. and should wrap up by 9:45. More information is available on the Brooklyn Democratic Party’s website. No, but imagine there were a couple of big bike parking garages on the Brighton Line and at the Junction. That would make the houses of people who live down there a whole lot more attractive to people who working in Manhattan. Tell them if we don’t get congestion pricing, we’ll take away the Meade Esposito Express. So how are they going to get to jobs at Boro Hall? But is that map right? Have they added four stops on 4th Avenue on the Park Slope border? Uh oh. Can’t help but notice that both of the “anti” speakers have roots in transit unions. Uh, isn’t a plan that generates a defined stream of transit revenue exactly what the people whose paychecks come from those revenues would dream of? Won’t maintenance and expansion of our transit system result in transit jobs? What am I missing? They get theirs off the top. They are worried that additional revenues might help the serfs. They need not worry. A friend at the TWU told me that the concern is rooted in transit workers who are at the rail yards and bus depots in Manhattan and often work late and off-shift. Seems lame, but there it is. I assume there is free personal parking at those locations. SF Bay Area voters get to decide whether or not the tolls on the Bay Bridge go up by a dollar. 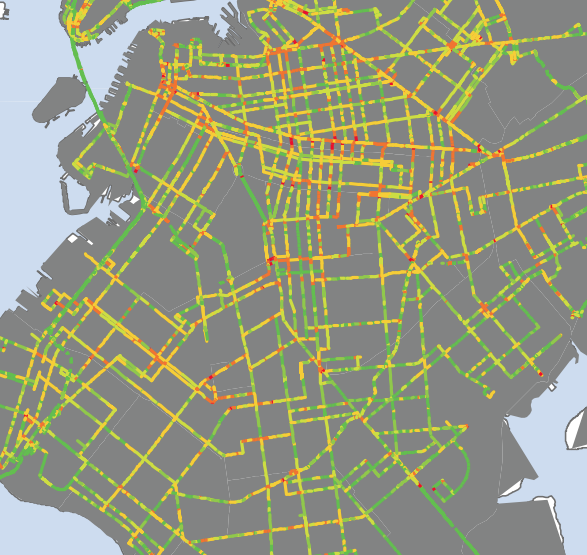 Yet NYC might get congestion charging without any kind of vote by the people at all. In 2009 the city council voted to establish congestion pricing and the city begged and pleaded with the state government to be allowed to get our congestion nightmare under control. New York State turned its back on the city. Democracy? I’m OK with our system whereby we elect leaders who study issues and take input from constituents and sometime have to make decisions that “the majority” doesn’t like – like to protect minorities, or the environment, or make near-term investments to make for a better future. Things that majority-voters sometimes don’t understand because we’re all to busy to exhaustively study every issue. You’ve been to community board meetings, right? *edit* Take education. Not my strong suit. Would you ask me about an issue like mayoral control? Why would my vote count as much as someone – say, a parent – who had spent time really getting to know the issue and understood it deeply? I’d say transportation is the same. I find very few “average people” have taken time to deeply understand the issues – hey, you can’t dedicate your life to everything, right? I think the views of those who have waded deeply into the issues should count more than 1:1 with Joe Caresnot. In other words you are all for democracy when the voters agree with you, but not otherwise. The United States is a representative democracy. It is supposed to work by electing representatives who, based on the best evidence, then make laws and decisions in the best interest of the community they represent as a whole. Such a system does not require a majority of the community to agree with each decision – they may not have all of the evidence. If you strongly disagree with the decisions made, then you may elect a different representative at the next election. So you believe in government by referendum? As a citizen, I would not want to spend all my time evaluating policy decisions in order to know how to vote. I’d rather have someone with experience and knowledge of the issues to do that for me. Even if I did have the time for that, I would be in the minority while the decisions would be made by the votes of my fellow, less-informed citizens. The District 33 Transpo Debate: Can They Top Yassky on Livable Streets? Simon's presence in Albany is one reason to believe a congestion pricing vote might play out differently this time. Her predecessor, Joan Millman, sat on the fence during the public debate over congestion pricing in 2008 before expressing her support when it was too late to matter.